Doctor of Sciences (Physics and Mathematics), Professor. Head of the Chair of Dynamical Modelling and Biomedical Engineering, Department of Nano- and Biomedical Technologies, Saratov State University. Head of the Laboratory of Nonlinear Dynamics Modelling, Saratov Branch of the Institute of Radio Engineering and Electronics of Russian Academy of Sciences. B.P. Bezruchko was born in 1946 in Russia. (1964) graduated from the Department of Radio Device Construction of Saratov Aircraft College. (1969) graduated from the Department of Physics of Saratov State University (SSU). 1964, controller of radio devises at the Plant of Radio Engineering. 1969-1972, post-graduate student of the Chair of Electronics of SSU. 1972-1981, teaching assistant of the Chair of General Physics of SSU and a scientific researcher in the Institute of Mechanics and Physics of SSU. 1981-1992, scientific secretary, senior researcher and head researcher of the Saratov Branch of the Institute of Radio Engineering and Electronics of Academy of Sciences of USSR. In 1986 he has organized the scientific group "Nonlinear phenomena in semiconductor materials and devices". Now this group is reorganized to the Laboratory of Nonlinear Dynamics Modelling. 1992-2005, Professor of the Chair of Electronics, Oscillations and Waves at the Department of Nonlinear Processes of SSU. From 2003 he is the Head of the Scientific Group of Dynamical Modeling and Diagnostics at the Institute of Natural Science. From 2005 B.P. Bezruchko is the Head of the Chair of Dynamical Modelling and Biomedical Engineering at the Department of Nano- and Biomedical Technologies of SSU. 1980 - degree of Candidate of Sciences (PhD) from Saratov University. The title of the candidate thesis: "Experimental investigation of nonstationary and stochastic phenomena in extended self-oscillating system of interacting electron beam and electromagnetic wave". Scientific supervisor: Prof. D.I. Trubetskov. 1994 - degree of Doctor of Sciences from Saratov University. The title of the thesis: "Multistability and chaos in high-dimensional nonautonomous dissipative systems (experiment and models)", speciality Radiophysics. Radiophysics and electronics, nonlinear dynamics, modelling from time series analysis with applications to physiological and medical diagnostics, physical experiment. Soros Associated Professor, 1998 and 1999. State scientific fellowship, 1996-1999 and 1999-2002. Supervisor of the collective projects supported by the Russian Foundation for Basic Research and the Ministry of Education of Russian Federation, 1996-2006. Lecture courses "Theory of wave processes", "Dynamical chaos", "Synergetics", "Theoretical foundations of electrical engineering" and "Mathematical modelling" for the students of SSU. Seven Candidate works have been performed under the supervision of B.P. Bezruchko (Seleznev Ye.P., 1990, Ponomarenko V.I., 1992, Prokhorov M.D., 1997, Ivanov R.N., 2001, Smirnov D.A., 2001, Surchalova L.V., 2001, Dikanev T.V., 2005) and 20 Soros grants have been received by his students and post-graduate students. Under the supervision of B.P. Bezruchko many young students were awarded medals, grants and diplomas at different scientific competitions. From 1996 he delivers the lecture course "Oscillations, waves and synergetics" for the schoolchildren in the Lyceum of Applied Sciences of SSU and teaches schoolchildren physics in the Lyceum of Mathematics and Informatics. B.P. Bezruchko is the member of the Academic Councils in SB IRE RAS and SSU. He is a Secretary-in-Chief of the journal Applied Nonlinear Dynamics edited by the Saratov State University. He has actively participated in organizing scientific conferences, schools and seminars being the member of the Organizing Committee of the nine Schools in Radiophysics and Electronics and five International School-Seminars on Chaotic Oscillations in Radiophysical Systems. He is an expert of the Russian Foundation for Basic Research. Boating, fishing, teaching physics in school. B.P. 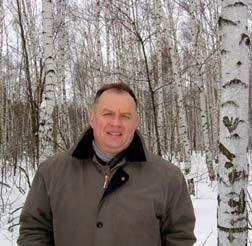 Bezruchko actively participates with the reports at different scientific conferences, schools and workshops in Russia and abroad (1999, Ronne, Denmark; 2000, Dresden, Germany; 2001, Delft, The Netherlands; 2004, Zurich, Switzerland). In 2005, on invitation of foreign colleagues he visited Toronto University, Canada. B.P. Bezruchko has about 200 scientific publications and tutorials, including 7 certificates of authorship, 52 articles in referred journals and 4 collective monographs "Electronics of Backward Wave Tubes" (1975), "Chaos and its Reconstructions" (2003), Way into Synergetics" (2005), "Mathematical Modelling and Chaotic Time Series" (2005). P. Tass, D. Smirnov, A. Karavaev, U. Barnikol, T. Barnikol, I. Adamchic, C. Hauptmann, N. Pawelcyzk, M. Maarouf, V. Sturm, H.-J. Freund, and B. Bezruchko, "The causal relationship between subcortical local field potential oscillations and parkinsonian resting tremor" // J. Neural Eng. -2010. -Vol.7. 016009. A.S. Karavaev, M.D. Prokhorov, V.I. Ponomarenko, A.R. Kiselev, V.I. Gridnev, E.I. Ruban, and B.P. Bezruchko Synchronization of low-frequency oscillations in the human cardiovascular system // Chaos. -2009. -V.19. 033112. Smirnov D., Barnikol U.B., Barnikol T.T., Bezruchko B.P., Hauptmann C., Buehrle C., Maarouf M., Sturm V., Freund H.-J., and Tass P.A. The generation of parkinsonian tremor as revealed by directional coupling analysis // Europhysics Letters. -2008. -V.83. -P.20003. Prokhorov M.D., Ponomarenko V.I., Karavaev A.S., Bezruchko B.P. Recovery of dynamical models of time-delay systems from time series: Application to chaotic communication // Nonlinear Phenomena Research Perspectives, Ed. Wang C.W., New York: Nova Science Publishers. -2007. -P.7-53. R. Stoop, A. Kern, M.C. Goepfert, D.A. Smirnov, T.V. Dikanev, B.P. Bezruchko. A generalization of the van-der-Pol oscillator underlies active signal amplification in Drosophila hearing // Eur Biophys J. -2006. DOI 10.1007/s00249-006-0059-5. B. Bezruchko, D. Smirnov Nonlinear Dynamical Models from Chaotic Time Series: Methods and Applications // Handbook of Time Series Analysis B. Schelter, M. Winterhalder, J. Timmer. -2006 -Ch.8. -P.193-223. B. Bezruchko, D. Smirnov, I. Sysoev Identification of chaotic systems with hidden variables (modified Bock's algorithm) // Chaos, Solitons and Fractals. -2006. -V.29. -P.82-90. D.A. Smirnov, M.B. Bodrov, J.L. Perez Velazquez, R. A. Wennberg, and B.P. Bezruchko, "Estimation of coupling between oscillators from short time series via phase dynamics modeling: limitations and application to EEG data", Chaos, 2005, v. 15, 024102. T. Dikanev, D. Smirnov, R. Wennberg, J.L. Perez Velazquez, and B. Bezruchko, "EEG nonstationarity during intracranially recorded seizures: statistical and dynamical analysis", Clin. Neurophysiol., 2005, Vol. 116, pp. 1796-1807.